Let’s take a look at this beautiful contemporary cottage, shall we? 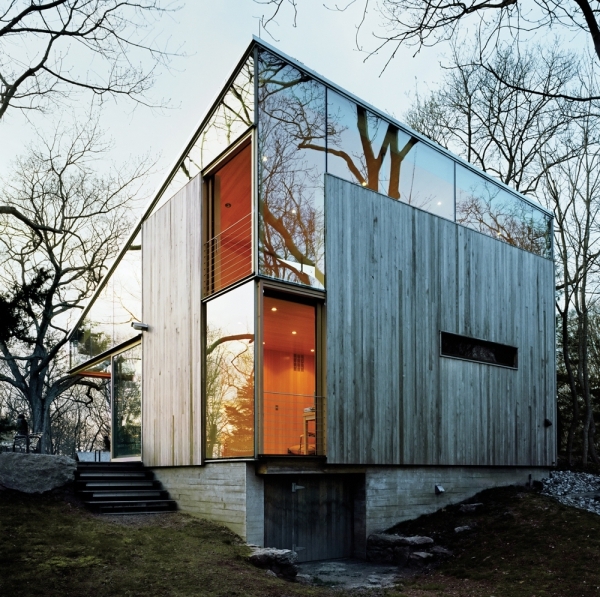 It’s located in Connecticut and it was designed by Grey Organschi Architects. The exterior has an angular shape and cool-colored wood. 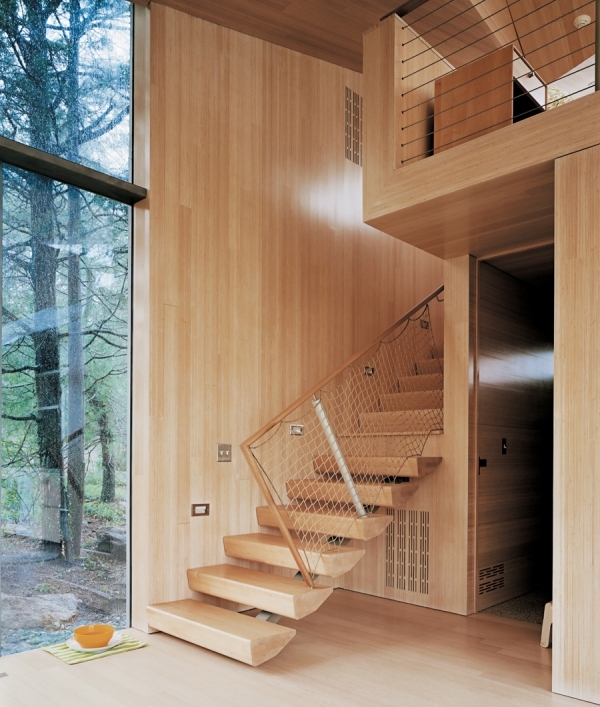 The shape is interesting and exciting, and the wood blends in perfectly with the lovely surroundings. There are lots of gorgeous windows, allowing fabulous natural light into the home and providing views of the natural landscape. The inside of the contemporary cottage is full of light wood, fashioning a cozy and inviting atmosphere. The kitchen space is small but perfect, fitting snugly under the loft bedroom. In the kitchen, shelves, cabinets, and a drawer provide a space for storage, and a stainless steel refrigerator brings a bit of a sleek feel to the design. We love the wooden doors, they give you the ability to hide the kitchen at a moments notice. The dining area consists of a wooden table and wooden chairs with gray cushions. Magnificent circular ceiling lights hang over the space, adding a little more pizazz to this contemporary cottage. The living room is surrounded by floor to ceiling windows. It also has a fantastic indoor/outdoor experience. A cream sofa is paired with a rectangular side table, and a stunning green chair and ottoman bring a little color to the design. We love the curves in the chair, they add a lot of interest to the room. 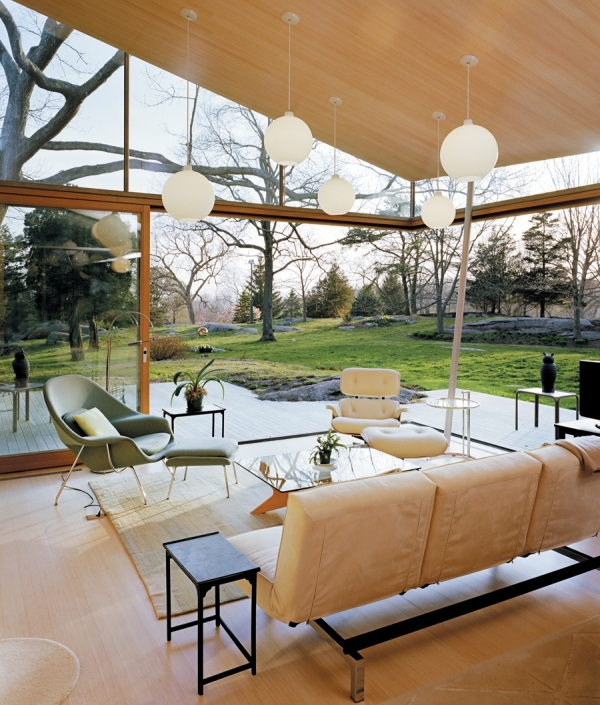 A cream Eames chair and ottoman, and a marvelous table with a glass top complete this seating area. Small plants bring a bit more liveliness to the design, and the same circular lights we saw in the dining area, adorn the ceiling. 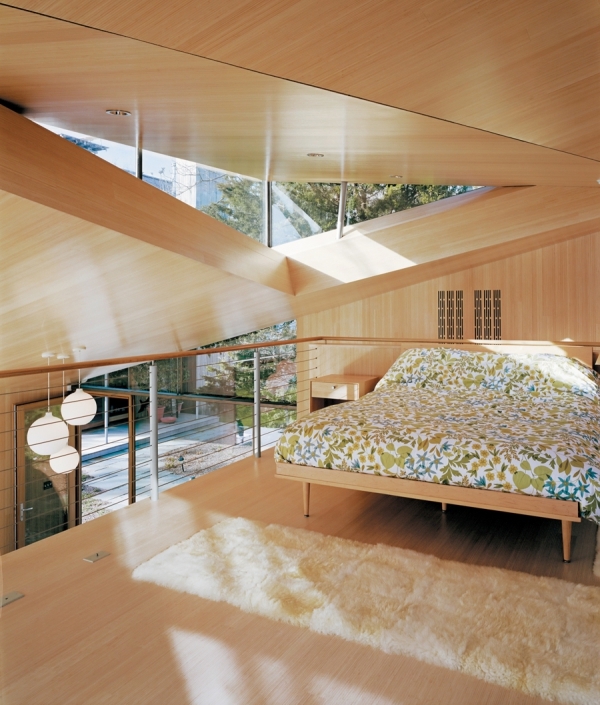 The loft bedroom is simple and beautiful. We love the patterned comforter and the fur rug, they add a bit of color and texture to the space. What do you think? Do you like this contemporary cottage?